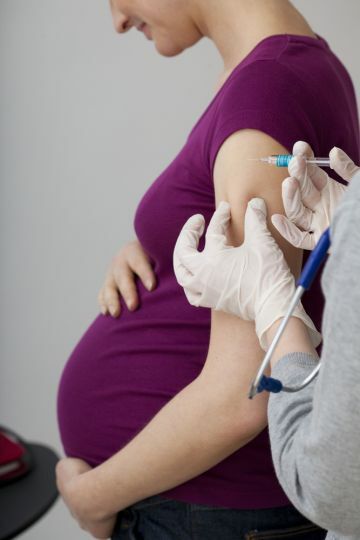 Good news: Researchers haven't found a relationship between taking the flu shot while you're pregnant and autism. If you're pregnant, you've probably been wondering whether you should get your annual flu shot as we head into the coldest months. Hopefully this news, along with the recommendation that all pregnant women should take the vaccine, will help you make up your mind: A new study published in JAMA Pediatrics found no significant link between taking the flu shot during pregnancy and autism. The study also found that women who catch the flu during pregnancy won't pass an increased autism risk to their children. While previous studies have suggested a link between maternal fever during pregnancy and autism risk, this one didn't observe this link—but that doesn't mean we should automatically take it as truth. It's definitely important for pregnant women to keep themselves as healthy and infection-free as possible. Researchers looked at the health records of 196,929 babies born between 2000 and 2010—about 1.6 percent of these children had autism. Researchers then looked at their mothers' health records: Less than 1 percent of women surveyed had the flu during pregnancy, and about 23 percent took flu shots. While the study found a slightly increased risk of autism when mothers took the flu shot during their first trimesters, they believe this might be purely coincidental. The CDC's guidelines recommend that all pregnant women take the flu shot, as influenza can have larger effects (including premature delivery) on a growing fetus. "We feel [this research] should be reassuring for prospective mothers," study author Lisa Croen said, according to NPR. "The way we feel people should interpret this is that there is really not any increased risk for autism, and we're recommending no changes in the vaccine policy. We know that pregnant women are particularly vulnerable. There are lots of changes in their immune system and lungs and heart. It's especially important to protect pregnant women against the flu."